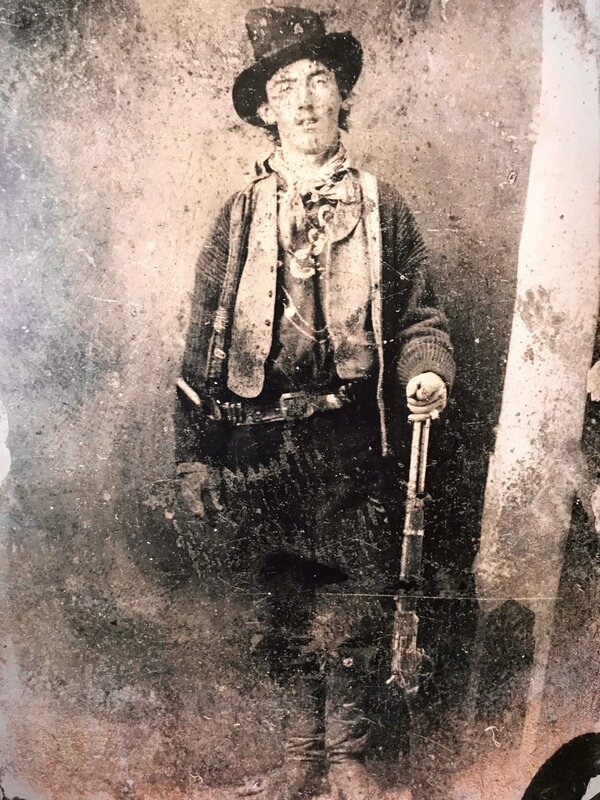 Billy the Kid in the 1870s, in the only known photo of him. Billy the Kid, in 2018, welcomes tourists to the Billy the Kid National Scenic Bypass. Billy the Kid, awaiting his hanging, escaped from the Lincoln County Courthouse, killing two deputies in the process. 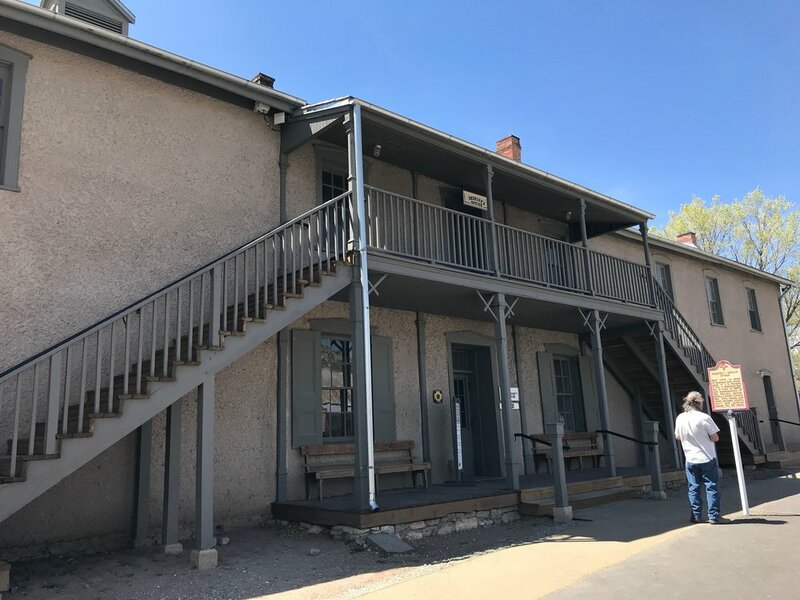 The Torreon, Lincoln's oldest building, was used by Spanish settlers to hold off Indians, and by snipers during the Lincoln County War in 1878. The Lincoln County War featured real events that became movie cliches. There were gun battles fought at full gallop, drunken cowboys shooting up the town, and a well-intentioned lawyer or two who paid for their naiveté with their lives. Over there stood the McSween house, set on fire in the midst of a shootout to drive out the gunmen inside. Steps away is the spot where Billy and his friends ambushed Sheriff William Brady, killing him and one of his deputies. Billy was later captured, convicted and sent back to Lincoln to be hung. In the building over there, he overpowered the deputy who had escorted him to the privy and shot him dead with his own gun. 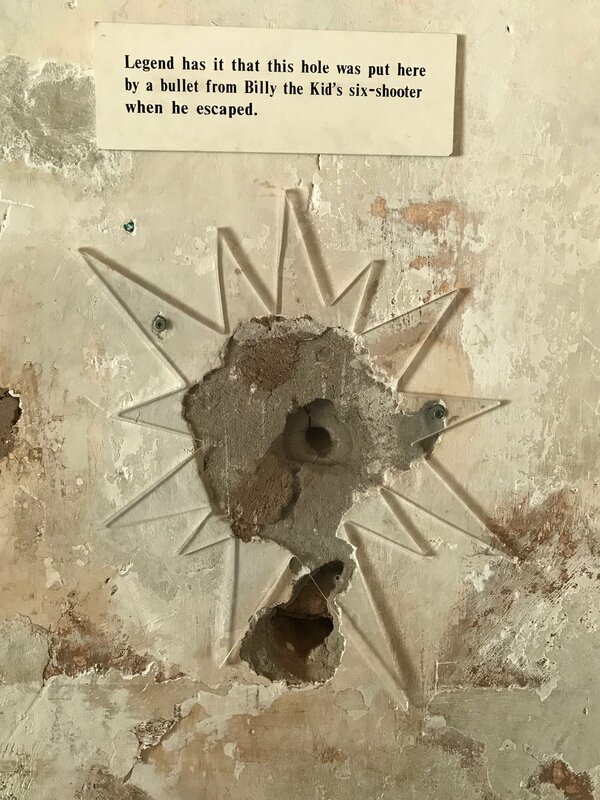 You can still see the bullet hole in the staircase wall. When the other deputy came running across the street, Billy shot and killed him, too. The gun violence in Lincoln made headlines around the country before the smoke had cleared. Readers as far away as Europe followed the adventures of Billy the Kid. Pat Garrett, the Lincoln County sheriff who caught up with the Kid, ambushing him when he came to visit his sweetheart, wrote one of the first best-sellers about Billy’s life, and many more followed. Then came the movies and TV shows. Keep in mind that during most of these gunfights, historian and storyteller Drew Gomber told a recent gathering in Lincoln, the shooters were usually drunk, which is why so many of their shots didn’t hit anyone. “It’s no coincidence that almost all the violence in the Old West happened around saloons,” he said. The real William Bonney was a murderer and a cattle thief, unworthy of anyone’s admiration. But even while he was still alive, the mythmakers were turning him into something else. Billy the Kid became an American icon: The loner, the drifter, who is loyal to his friends, kind to the locals and good with a gun. People have been making money off of that Billy the Kid for 140 years.